One of the best things about New York is you don't have to pay or even go into a museum to enjoy great art. Just look around, you will be surprised how much art is on display in public spaces. Right now, you can head downtown to the Park at City Hall for a visual treat. Five brilliant works by Alexander Calder are on display, set against the backdrop of the imposing elegance of City Hall’s 19th century architecture. 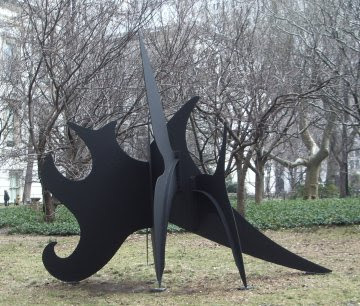 I'll wager no sculpture looks better out of doors than Calder's. His sculpture and mobiles are alive with movement. No matter how effectively presented in an interior space, they somehow appear confined, cramped ready to take off in flight. Many of his works certainly make me feel like flying. You decide. Experience these best by walking around them a few times. See how they change, as the environment changes with your every movement. Notice how different the shapes appear when viewed close to the nearby trees and shrubs. Now look at them from a wide angle against the buildings across the street. You'll find the mobile, Untitled, in the rotunda stairwell of City Hall. I hear you; "Sure I'd like to see them, but go downtown just for sculpture?" Think for a minute, isn't there something you have been meaning to pick up at Century 21? Keep in mind, St Paul's Chapel features a special 911 Exhibit, and there's great shopping on Fulton Street, in Chinatown, and at the Seaport; while there, visit "Bodies, The Exhibit," an educational treat that's terrific for kids as well as adults. Finally, don't forget all the restaurants at South Street? Address to remember: City Hall, Broadway and Murray Street, New York, NY 10007, 212-980-4575. Directions: MTA from 42nd Street Grand Central Station, 4, 5, 6, to Brooklyn Bridge, City Hall. From Times Square 2, 3 to Park Place or R to City Hall. Bus M1, M6, M15, M22, and M103.